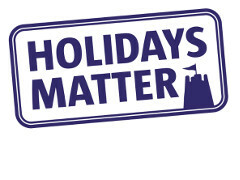 Holidays Matter network launched at our third annual Holidays Matter conference. Earlier this month, at the World Travel Market, we launched the Holidays Matter network at our third annual Holidays Matter conference. Since 2012, we have brought together the tourism and travel industries to brainstorm, debate and collectively work towards promoting the benefit of tourism for everyone. Through the network, we aim to work with a wider range of organisations to help open up the UK and its attractions to those who are otherwise excluded. What is good for society, is also good for business. Without question, tourism is an economic force in the UK; delivering £127 billion in GDP which accounts for 9.0 per cent of GDP (VisitBritain, Deloitte 2013). Tourism also employs 3.1 million and has the potential to create 630,000 more tourism jobs by 2025 according to VisitBritain. And yet almost 30% of people cannot afford an annual holiday (ONS: Poverty and Social Exclusion in the UK and EU) and still more miss out because the challenges of daily life are too great. How tourism supports economic health and growth in the UK is undoubtedly important, however, the sector presents equally significant benefits grouped together under a responsible umbrella: social, cultural and environmental. The impact of holidays on quality of life plus mental and physical health are well documented in numerous studies; our aim at Holidays Matter, is to increase the number of people, who otherwise would be excluded, experience these first hand whist influencing policies which currently hinder this progress – especially term time breaks and seasonality. Unfortunately the seasonal nature of tourism inhibits many, who would benefit the most from holidays, from taking a break away even if close to home or for a day trip. Seasonality also effects communities that experience an influx of tourism during peak times of the year but struggle either side, putting strain on local and national government resources while impacting the quality of life of those living in these destinations. By challenging the current status-quo, we can develop a new tourism model that acts not only as an industry but social force; opening up a world of possibilities that simultaneously benefit society and business. We want social tourism on the travel agenda across the UK.